Spicy Chilly: RCI-Chakka-Kumbil Appam/ Steamed Jack fruit dumplings. RCI-Chakka-Kumbil Appam/ Steamed Jack fruit dumplings. Chakka Appam or Kumbil Appam is an authentic dish belonging to 'God’s own country'. 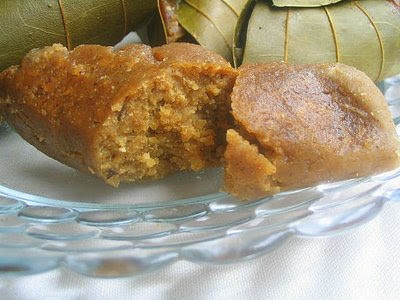 The sweet bits of Jack fruit bulbs incorporated with rice flour and jaggery, the wet dough wrapped and rolled carefully in bay leaves, pinned up using the tender midribs of coconut palm leaves, steam cooked to perfection, is indeed a delicacy, worth trying!. This is my first entry to RCI-Kerala hosted by Jyothsna. 1. 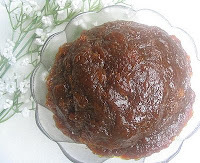 Melt Jaggery in ½ cup water, filter impurities and boil till thickens to attain the consistency of honey, in a broad and thick bottomed pan. 2. Add the chopped fruit pieces and grated coconut into the syrup and mix for a couple of minutes to blend well.Turn off the flame.Cool down to bearable warmth.Add rice four, 1/2 cup at a time, cumin seeds, salt and knead well to form a soft batter.Add water if necessary or the dough is too thick.This should neither be too thick nor too loose so as to wrap in the bay leaves. 3.Drop a tbsp of batter or more according to the size of the leaf, at one end, centred. 4. 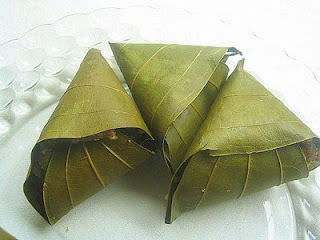 Wrap and roll the leaf to a cone shape so as to cover the batter. 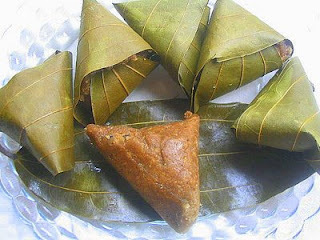 Secure the main stem of the leaf by tucking into the batter as in the picture. Tiny pieces of the mid rib of a tender coconut leaf(eerkkili) is also used as a pin to secure the edge of the leaf to the cone body. Steam cook for 20 minutes.If you pressure cook, avoid inserting the ‘weight-knob’ on the lid. Serve appams when cooled down to room temperature. be extracted by the modern methods and can be proceeded..
Kumbil appam can also be prepared using Chakka varatti (the picture in the right) or the Jack fruit preserve, with minimised efforts. One has to add rice powder, coconut gratings etc to the varatti, directly and proceed.The featured ones here were made like wise. I followed rough line measurements for the same. A cup of chakka varatti was mixed with 1/2 cup each of rice flour and finely grated coconut, 1/4 tsp coarsely crushed cumin seeds, a pinch of salt and 'no' cardamom..(I love the natural cinnamony flavour contributed by the vazhana ila)were all blended with just enough warm water to make a soft dough and coned with the leaves after checking the sweetness. Steam cooked for 20 minutes. The Fresh Green Bay leaf used for wrapping imparts that distinct, heavenly ‘Cinnamony’ flavour to the Appam.Yes, the leaf falls under the category of 'Bay leaves'.I am not sure whether these are the regular Tej patta. Commonly known as Kumbil ila ,Vazhana ila or Edana ila, in the state, I tried my best to search the sources in the net.The image here shows the closest properties of the leaves, but dried. The quest continues..where did the delicacy originate?..Central Kerala?.. Palai to be precise?..Requesting my blogger friends to share any more news about the same. This is the info. I've been able to gather. 1. Kumbil appam is also called Vaavu Appam by some communities in Kerala (seems to be mostly towards the south of Kerala and in Trivandrum) as they make it when performing "bali"/ remembering those who have passed on, during Karkataka Vaavu. Other communities prepare the Ela Ada for this ritual and prepare the Kumbil Appam as a sweet during the Jackfruit season. 2. The "edana" leaf that is used to make them is not the same as the cinnamon/ bay leaf. The edana leaf does have a somewhat cinnamon flavour and looks a little like the cinnamon leaf but is longer in shape. Rajani of vegetarian in ME has come up with her awesome step by step illustrations of making the same. A must see!!.. It's been ages since I had chakka appams! I remember eating these as a child during our yearly visits to Kerala. Chakka varatti is something which I love too...oooh , u just brought back some memories! I don't have any info to share with you on this. But looks mighty delicious. I have never heard of this dish..and looks so tasty. I've never heard about this recipe before. The pics and the way you've explained makes me crave for it.Too bad we don't get jackfruit where I live to try this recipe. yum yum yum and yum. Dish looks mouth watering. Perfect entry for RCI. Thanks for sharing. I think this month is going to be a TORTURE. 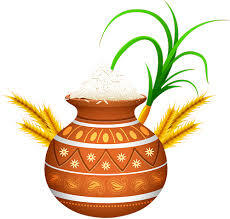 I will be seeing all the delicious kerala food every where in the blog world. Back at home my mom used to make this too when we were at home. Looks yummy!!! I was finding RCI- Kerala dish in Google search I find your dish here. 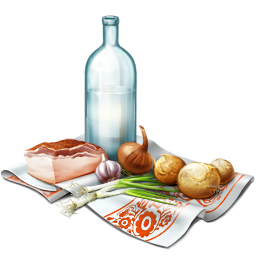 Great traditional dish with lots of information!!! I think you know about arusuvai friendship chain. If you not get any secret ingredients then tell me. 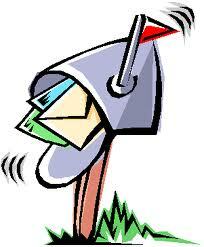 You are interested than write me at kajalkpatel@yahoo.com so I send some secret ingredients at your home address. Just got back from trivandrum and had quite a few of these :)))..This is truly a country snack!!! We even add a pinch probably of finely powdered cumin seeds for an extra flavour..try it sometime..
Edana leaves are the Indian bay leaves..The leaves add a distinctive taste right? That truly is some entry for the RCI Kerala cusine. Makes me miss naadu. It will take me dont know how much longer to have a bite of those. wow i am drooling at them :) one of by favorites loved the way it is wraped and the wonderfull aroma! Wow,that looks really amazing! I can smell those cooked jacfruits here!! Bharathy, pls mail me the entry and link to this. You can't imagine how hungry I'm looking at the picture again!! No idea where they originated but it is pretty common in Kottayam. Love the smell of the leaves when they are cooking. Kumbil apams I jus had these on my recent trip .. Thanks to all for your precious words here!.. Looks like authentic recipe bharathy... Looks Delicious too... Thanks for sharing.. These look delicious. I can almost smell the chakkavaratti. We make ela adai with filling wrapped in the rice paste and steamed. Vazhana ila are the leaves of the indian cinnamon tree. My sister-in-law was just telling me yesterday that they make these in Trivandrum. Eating only cakes, cookies and chocolates most of the time makes me forget about our traditional sweets. Looks really really good. Unfortunately all these are offlimits for now. But I'll keep in mind to try it for sure. Thanks for sharing this. I know just the basic stuff that I mentioned earlier. So I decided to ask a couple of people about this and shall get back to you with all the info. as soon as I have it. thank you for dropping my blog and leave ur comments. yours is a real traditional entry for RCI-Kerala. I fondly remember the days when my grand mom made this dish, esp in the jackfruit season. She called it THERALI, and the Vazhana leaf was locally called therali ela. As I understand, the leaf is a tropical leaf, of the indian cinnamon plant. Wonderful flavour. Can never forget it. Thanks for sharing the dish with the world. 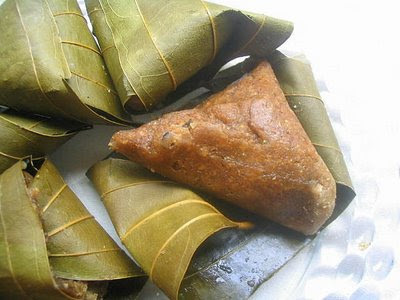 Looks awesome...wish I could taste some of it..using bay leaves to add flavor sounds yummy..We also make similar kind of stuff with idli atta stuffed inside bread fruit leaves and call it "Khotto" which translates to envelope in Konkani.